David Rogers writes about his experiences of Zambia’s South Luangwa National Park during the predator season. The water has all gone now. And so has the grass… long, long gone. It’s a battlefield out there. Impala totter on twisted legs over craggy, bone-breaking, ground. It’s a tortuous, terrible terrain scarred by heavy elephants and hippos in the wet and now mud baked by the sun. The hippos tortured by the terrible territorial fights crowd in the shrinking pools. Buffalo stagger in vast herds to drink, slake their thirst and then disappear into the dust. Lions lie panting and waiting. It is their time. And there are bones in the dust. Most trees are brittle, brown and leafless. But some are draped with flaming purple creepers while others erupts with yellow flowers. Birds flirt in flashing purple. 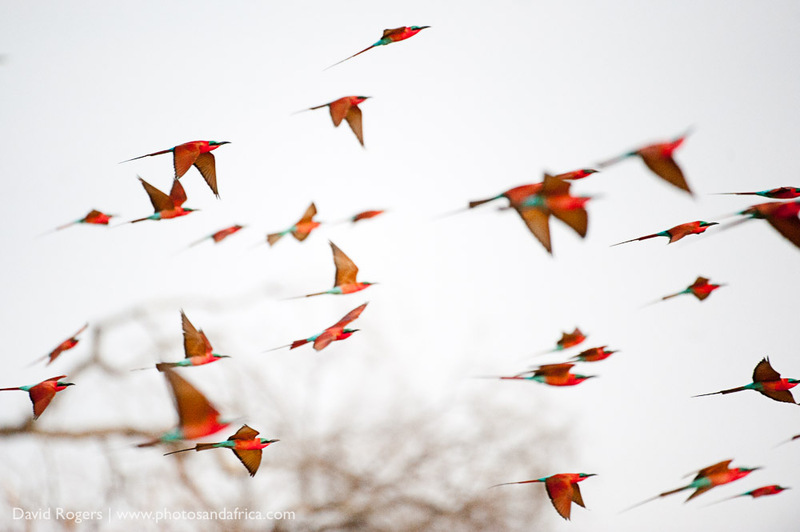 Carmine bee-eaters shriek and whistle above the mud banks. Crocodiles drag themselves across the dry lands. Everything is waiting for water. And it’s hot. But back at camp there is cold beer, whirring fans and friendly banter. This is Zambia in November and it’s primitive, wild and real. And it’s hot, so hot. But there are clouds on the horizon. Broken promises? Will they bring rain, or not? And the smell of it, or not? Rich and life giving, or not? Termites erupt from their mounds. And the young are born, the grass grows and life begins anew. Or not. This is November in Luangwa.